I made a few of these pins to give as gifts and to wear. 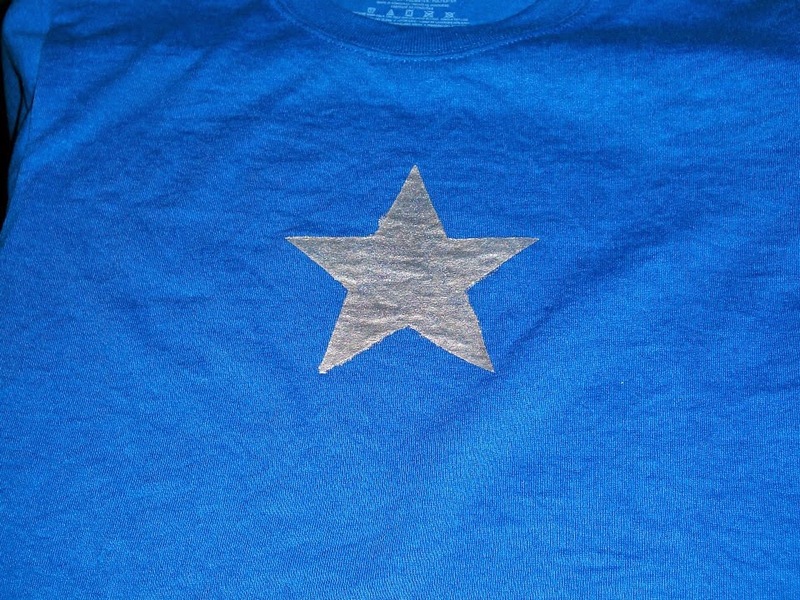 Using old (and clean) t-shirts or buying them inexpensively at your local craft store means the fabric will not fray like other fabrics. Felt could also be easily substituted. 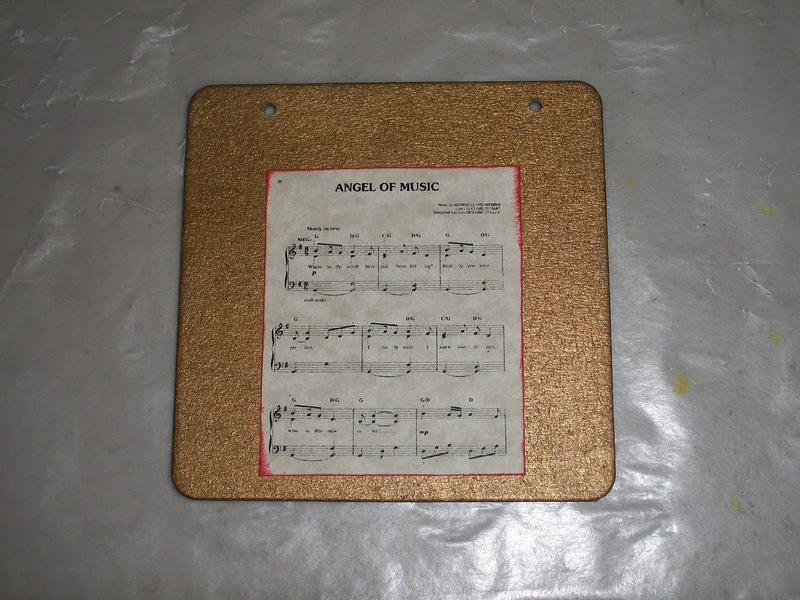 I followed this tutorial, except made a template from chipboard using one of the flowers on my Cricut (the cartridge I used was borrowed from a friend, and I can't remember which it was). 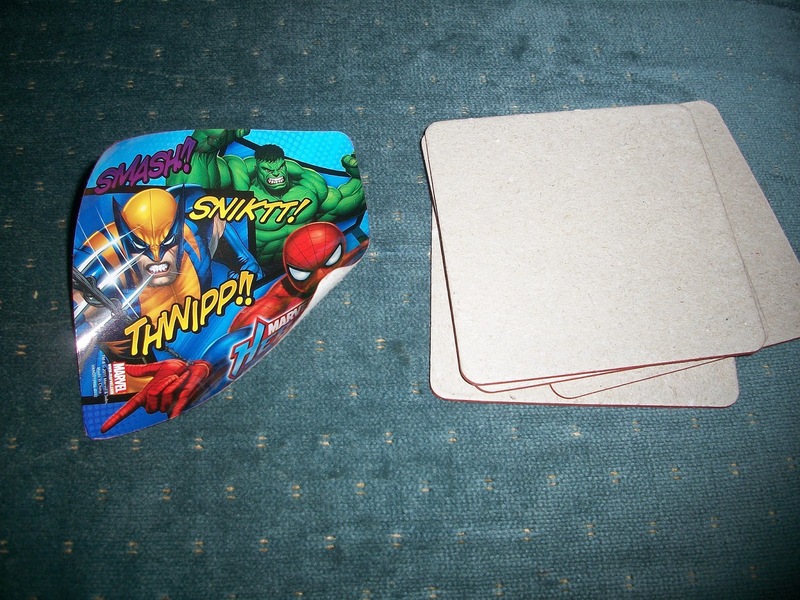 I also cut 1 1/2" circles from chipboard for the felt. 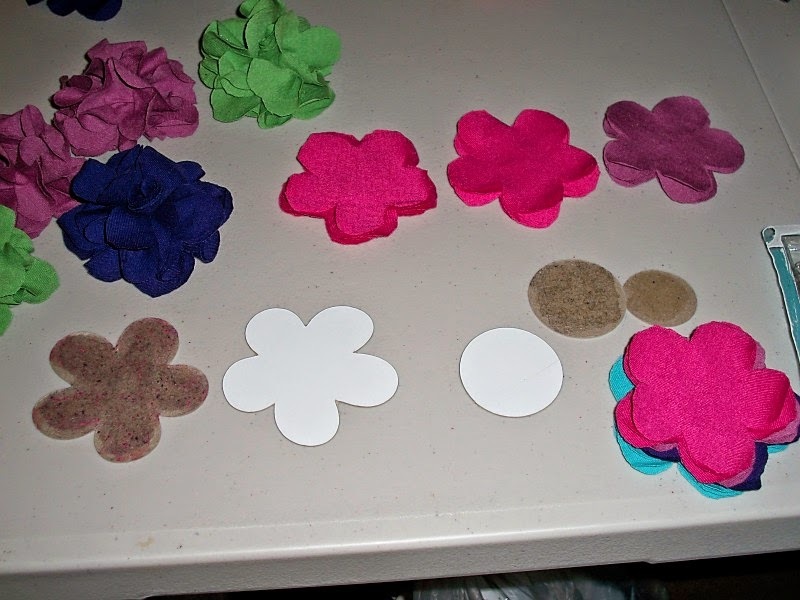 Here is the tutorial I followed from Emily's Little World, which I found via Pinterest. I did use some of repositionable adhesive on the chipboard templates to temporarily attached the fabric to the template to make cutting the flower shapes much easier. I did the same for the circle template and the felt. Flower and circle templates with some cut shapes and finished flowers. 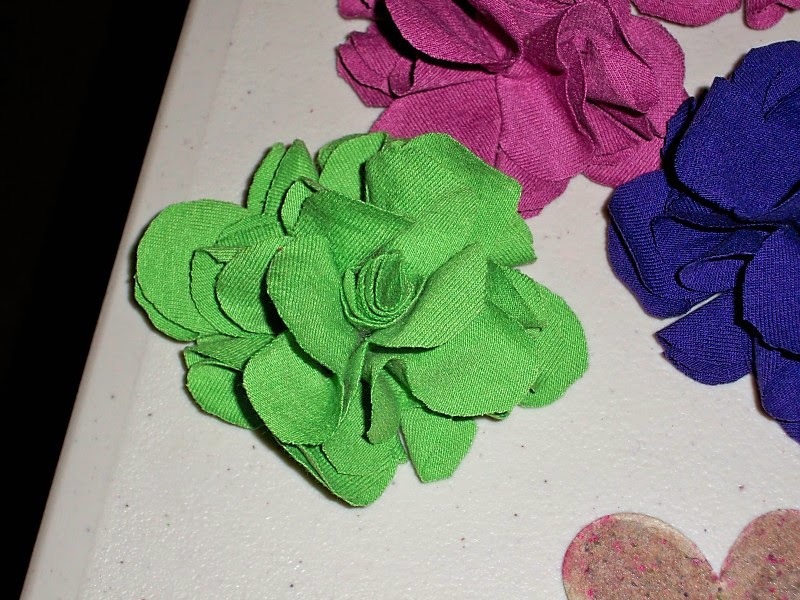 These flowers could be attached to barrettes or headbands as well. I made this headband as a joke for a friend when I was making the Hello Kitty Ear Headbands. 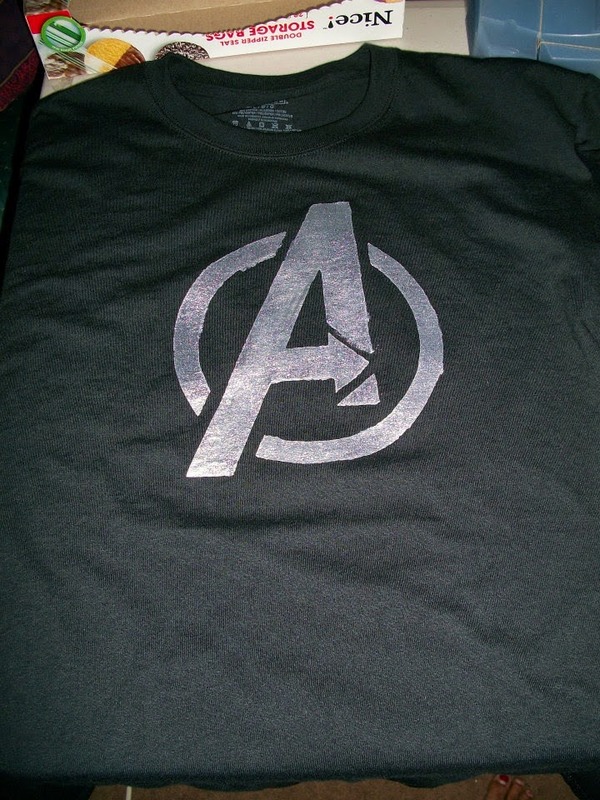 This turned out really well and was very easy and fast to make. 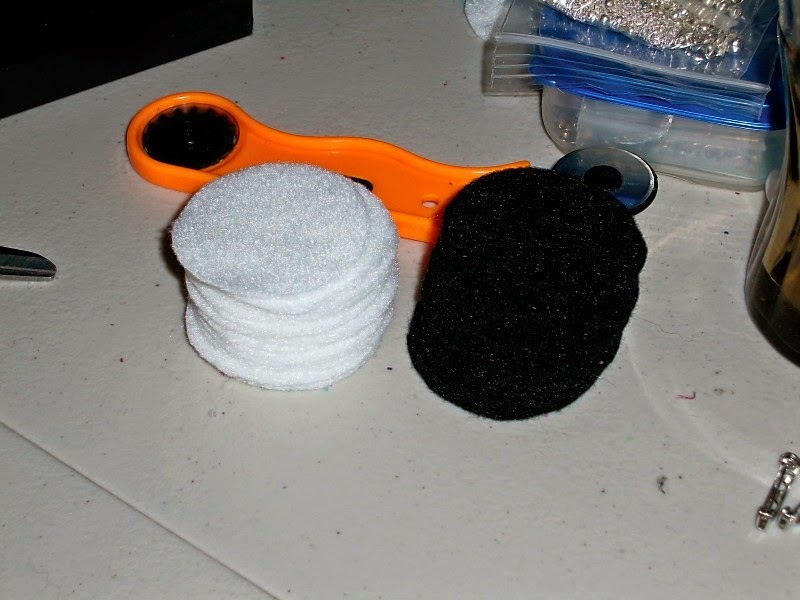 Fold the felt and place the “tab” at the bottom of the ear along the fold. You can pin the paper to the felt to make it easier to cut. 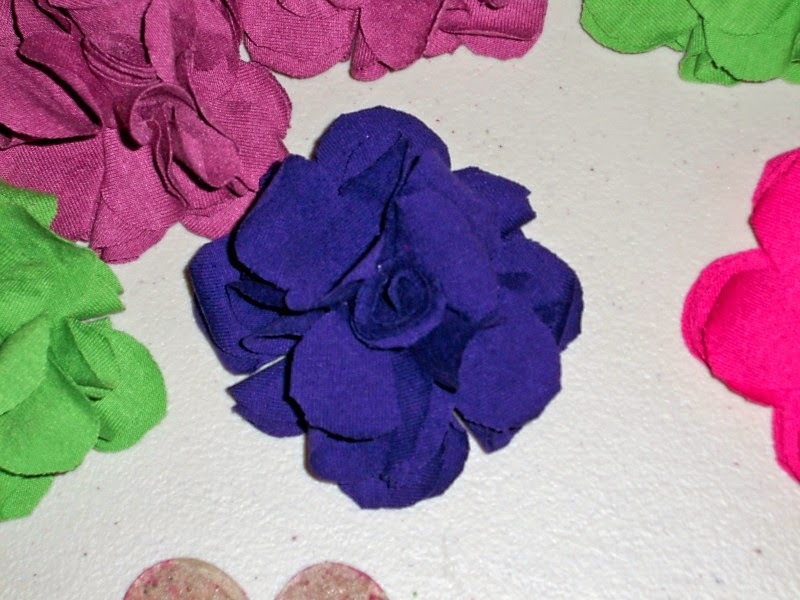 Cut the felt with scissors using the paper as your guide. 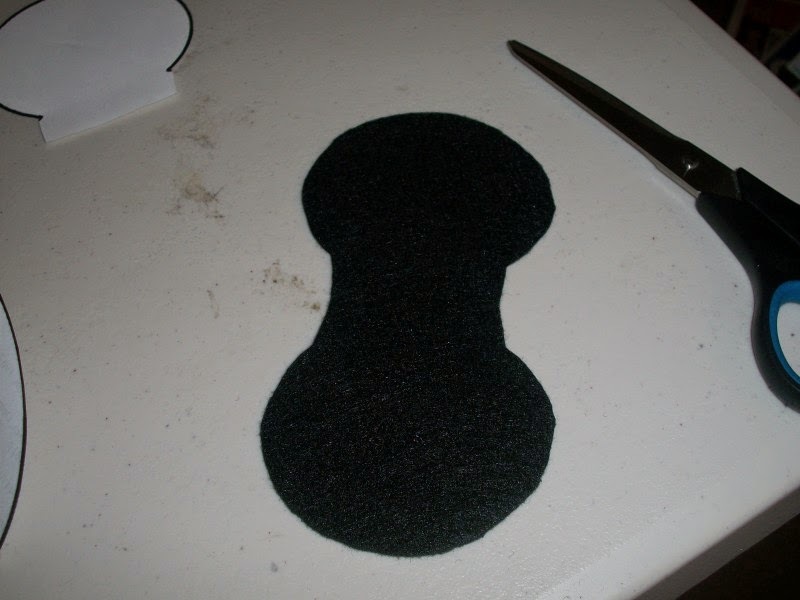 Once cut, open up the felt and it will resemble a figure “8” or dumbbell. Wrap the headband with black yarn attaching the starting end with hot glue and gluing every few inches for extra security. 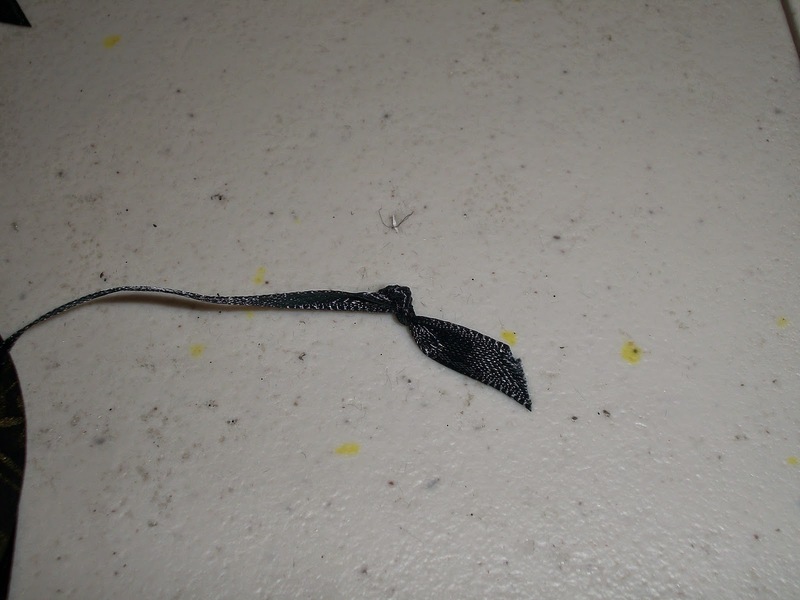 Once the entire headband is wrapped in the black yarn, use hot glue to secure the end of the yarn and headband. Trim excess yarn. 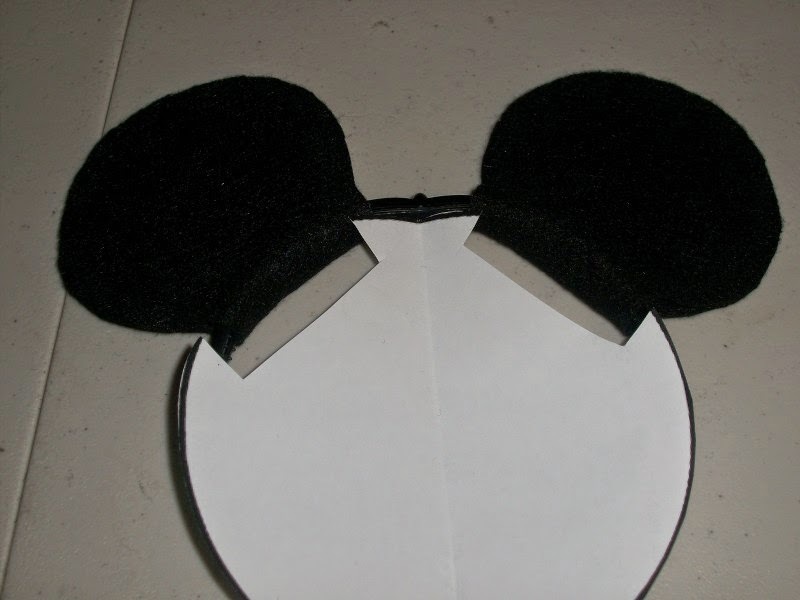 Fold ears around the headband (use the original template for spacing), and add hot glue to the center “tab” area to secure it to the underside of the headband. 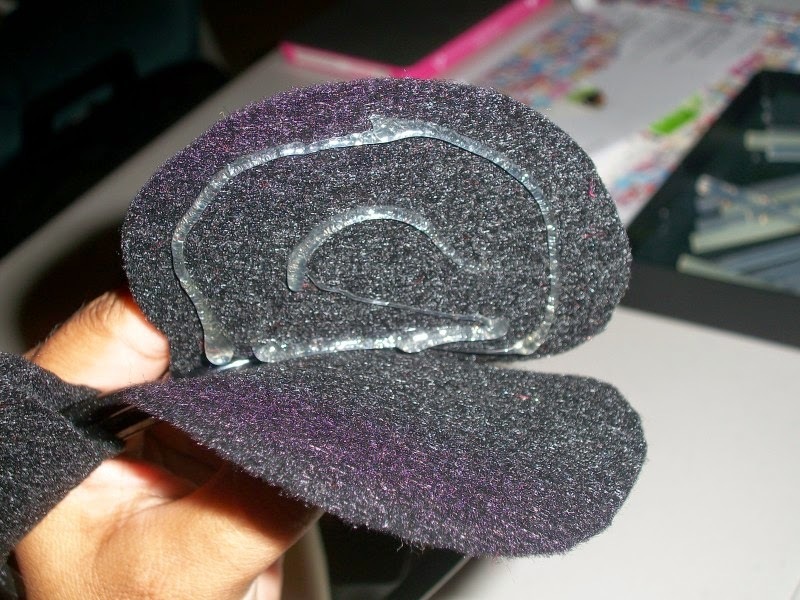 Add hot glue around the edge of the ear and at the topside of the headband. Press the ear sides together and down towards the headband to secure. Repeat on the other side. Use template for proper spacing of ears. 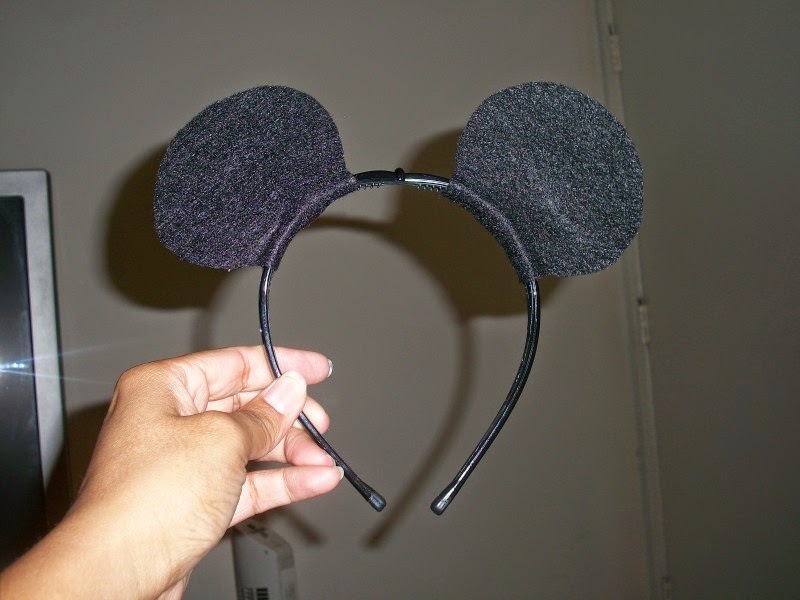 This is a quick and inexpensive craft which is perfect for that trip to the Disney Parks, or a Halloween costume, or for use as a photo booth prop. 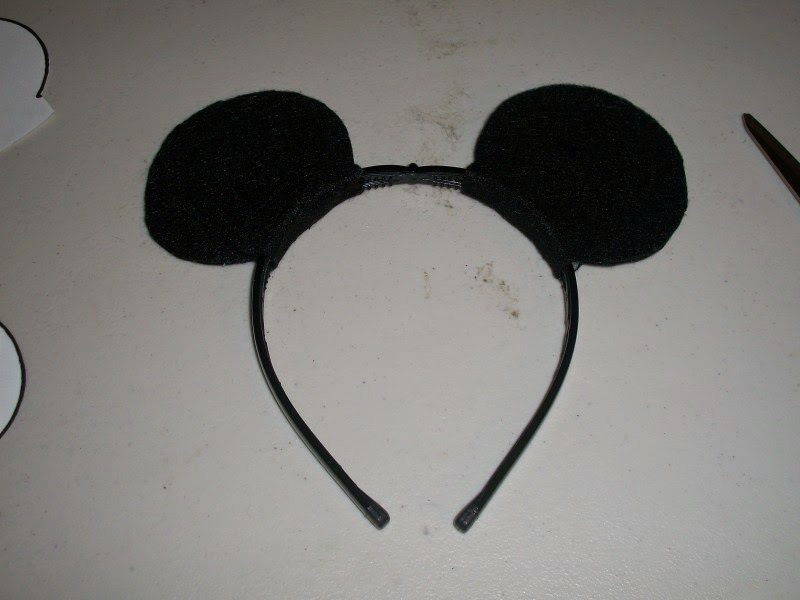 Add a felt or fabric bow for Minnie Mouse! Voila! 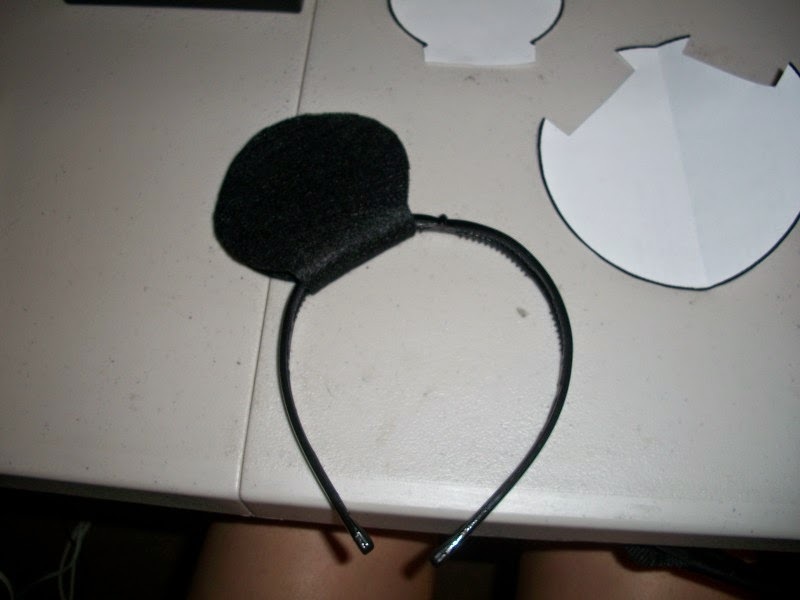 Mickey Mouse Ears headband is complete! Last year I threw myself a big birthday party, the kind of party kids have. I had the party at the beautiful Los Encinos State Historic Park. I also made some PVC bows and arrows using this tutorial, but I didn't curve the PVC as I found they worked better (arrows shot much farther) if I left them straight. This meant they didn't look like bows, but they worked so that's what was important to me. I also used pencil top erasers as the "arrow" and that also worked well. 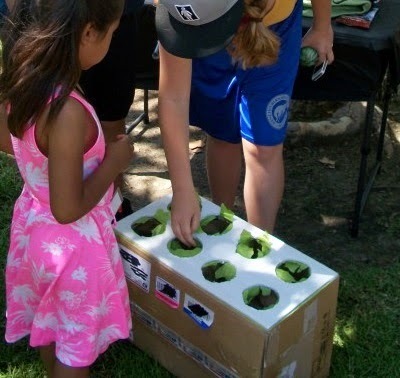 I made a Hulk Smash Box similar to this, but I used one of the boxes I had received from ordering all the candy favors online. I used white foam core board and cut holes in the cardboard box and the foam core and sandwiched green tissue paper between them. I put small prizes inside. 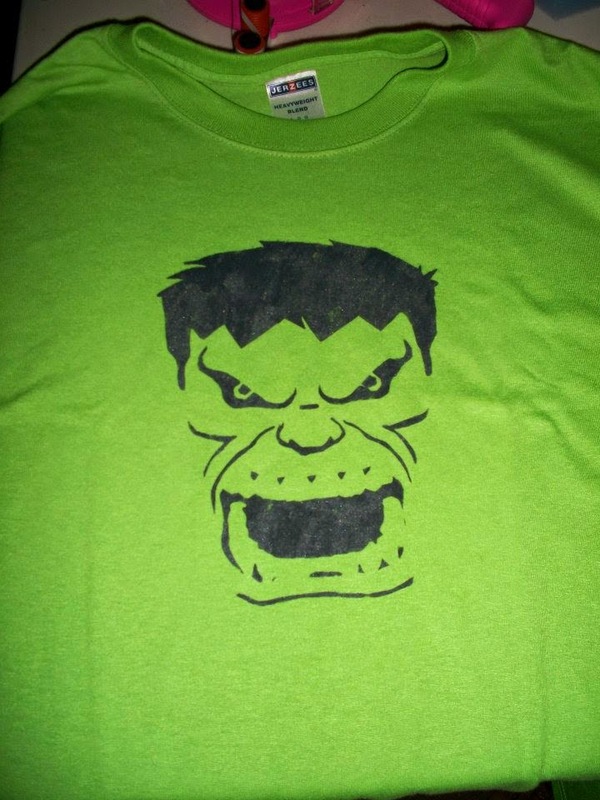 "Smashing" the Hulk Smash Box. 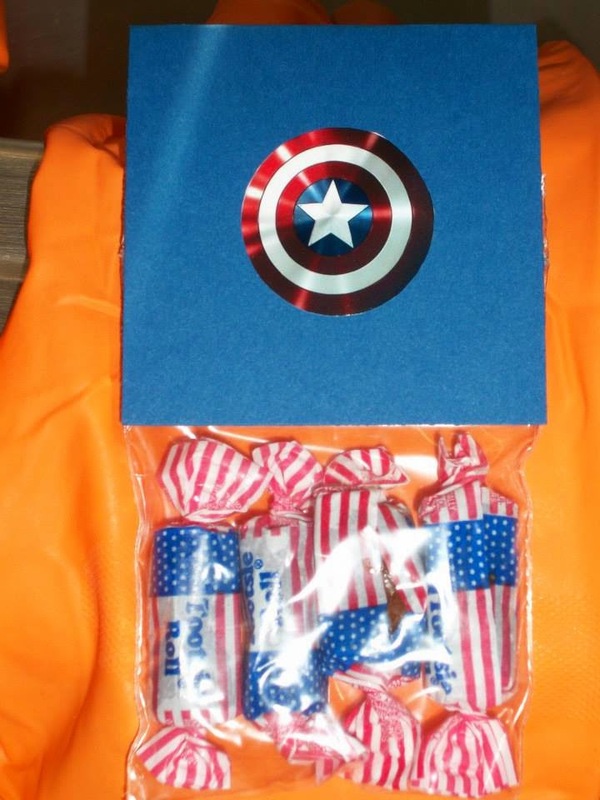 Here are a few of the favors I made for each of the guests at the party. I made sure there were things specific for kids, too. 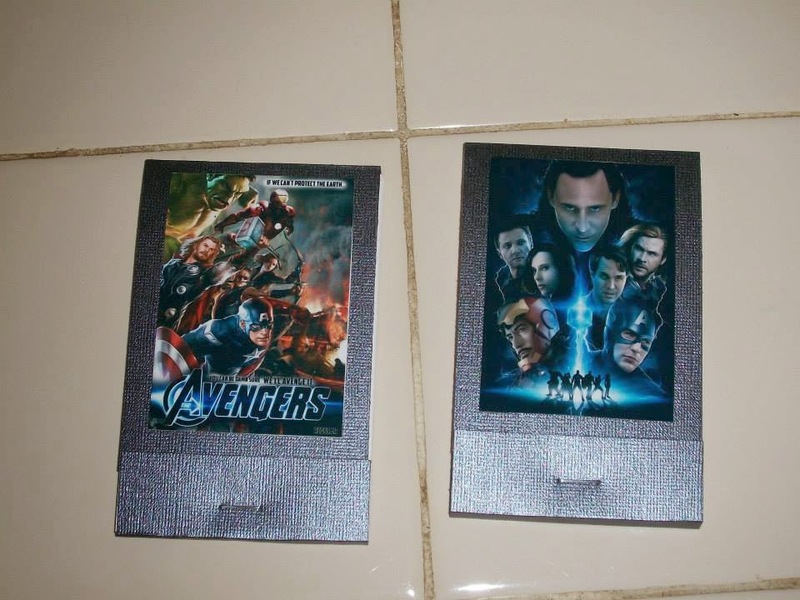 I got this cheeky idea for Black Widow favors. I also made arrow straws filled with Pixy Stix. 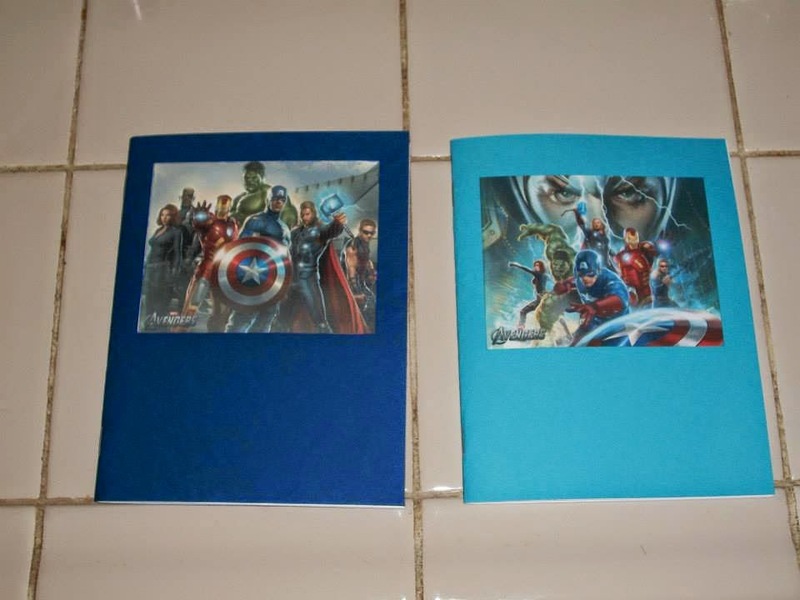 I don't have a picture of them, but I made them again for my niece's Hunger Games birthday party seen here. I also made black arrow pens gluing felt to form the fletching. 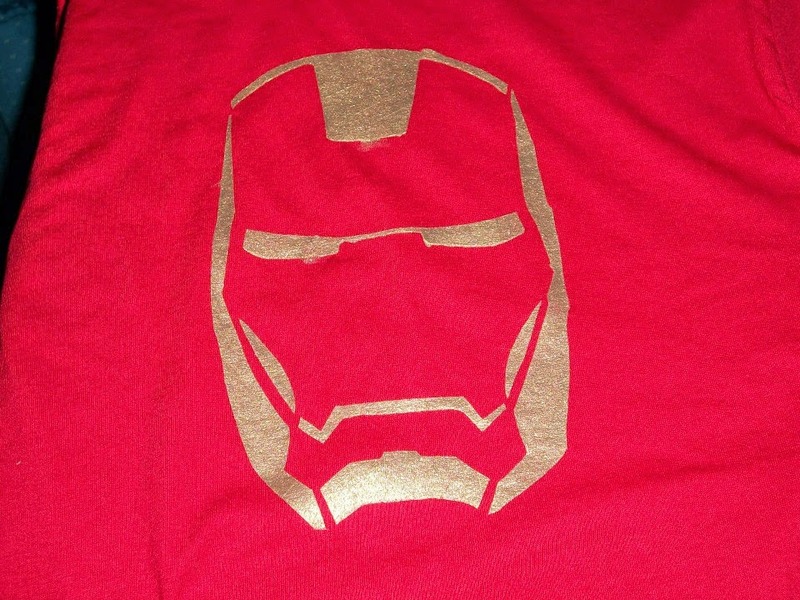 Using the freezer paper stencil technique, see this tutorial, I made these shirts for prizes. 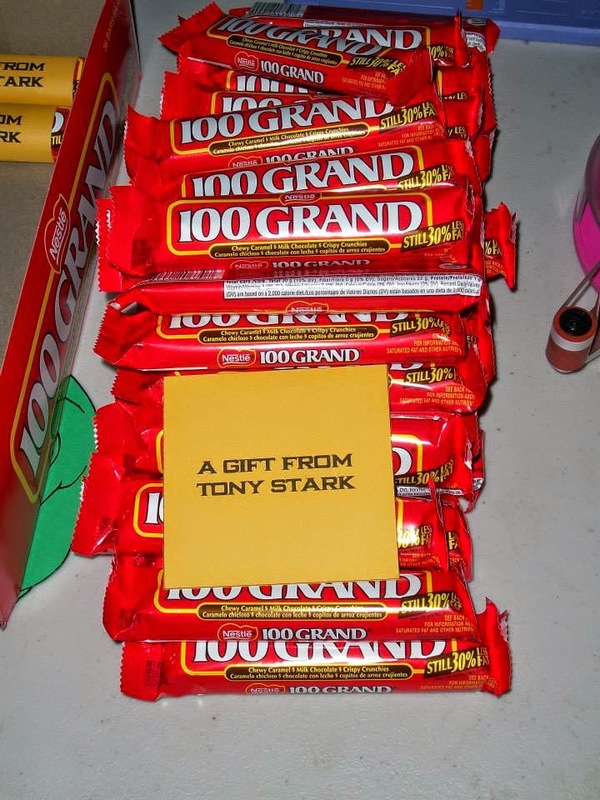 Tony Stark gave the 100 Grand bars. 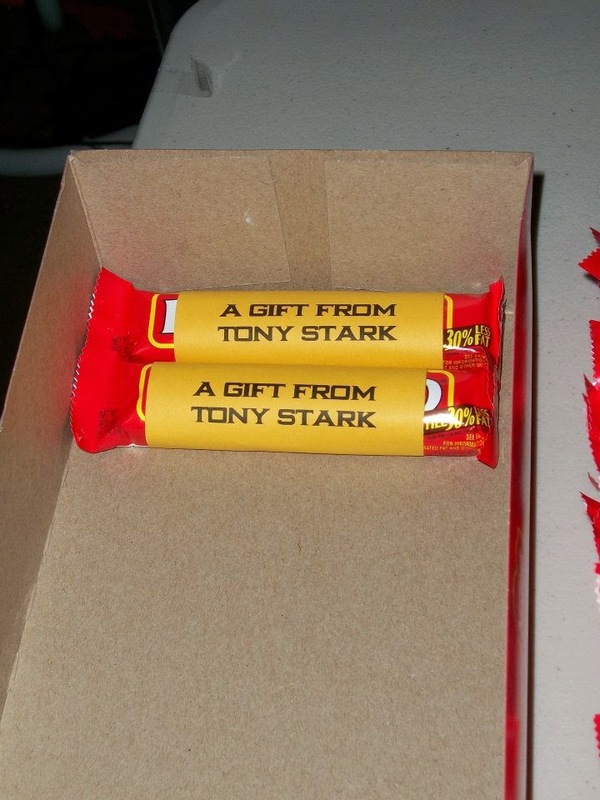 Tony also had "Tony Stark Party Bags" which were 6x9" red satin drawstring favor bags containing a deck of cards, 2 red dice, and golden and red casino chips. 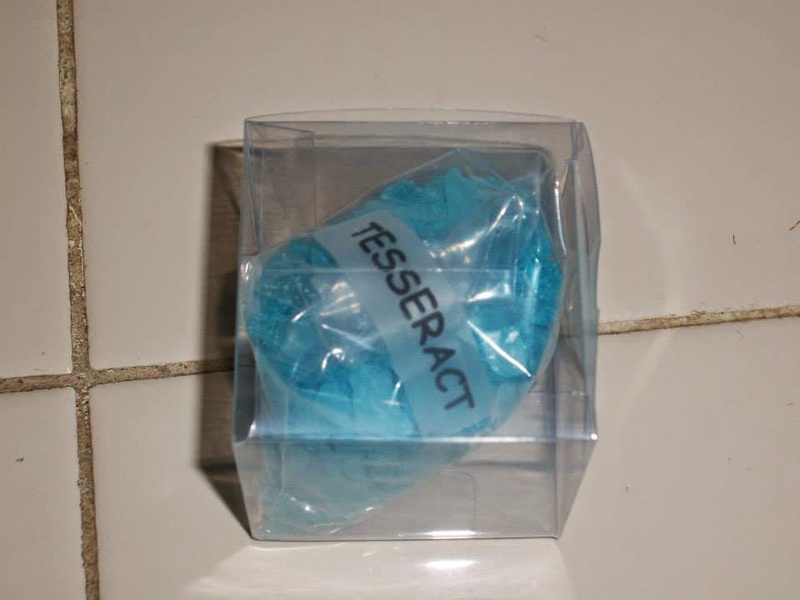 Tesseract Cubes (cotton candy flavored rock candy) which I had to label since it looked like it was from Breaking Bad. These are the first matchbook style notebooks I made. 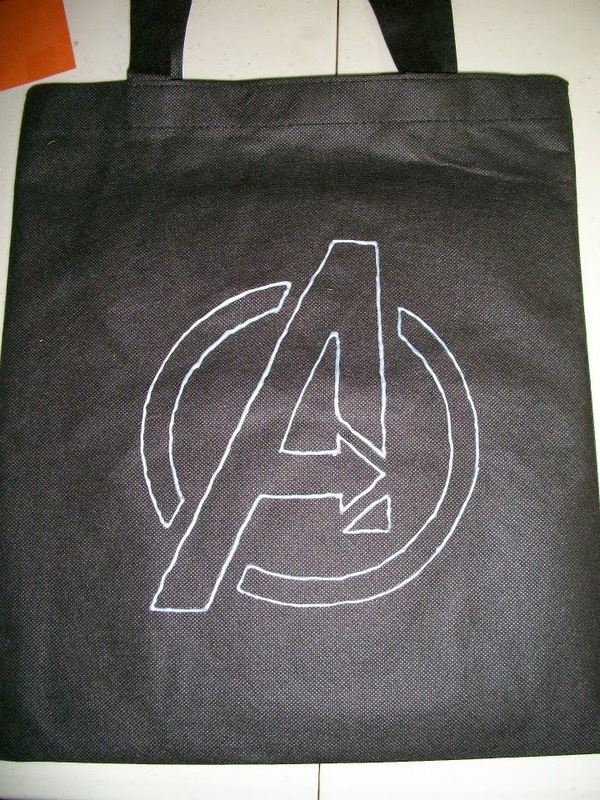 I printed a pumpkin carving stencil onto cardstock to use as a stencil to paint the "A" logo onto the tote bags which I gave to each of the guests to hold all of their goodies. 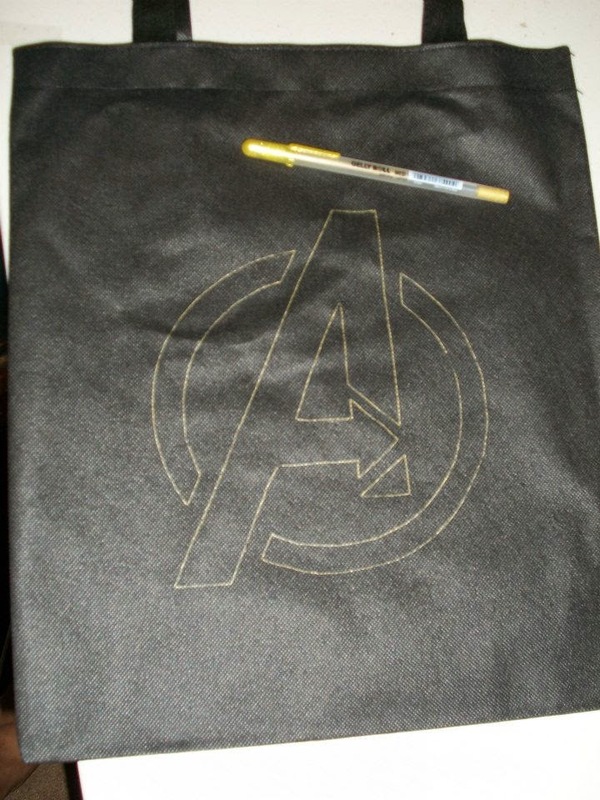 I first traced the image using a gold pen (to show up on the black bag), then covered that outline in dimensional fabric paint in silver metallic. 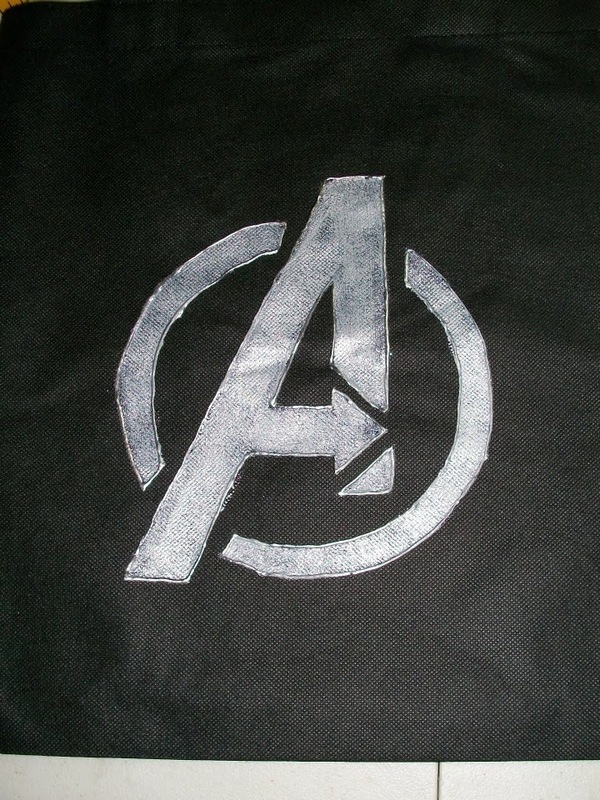 Then I filled in the logo with soft fabric paint in silver metallic. The paints I used were Tulip brand. Fill in with "soft" style fabric paint. 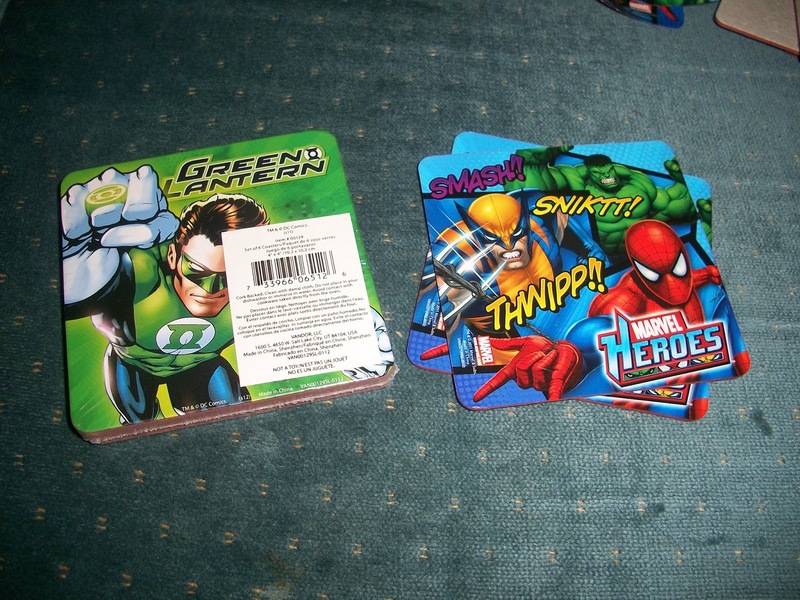 I also made Avengers bookmarks, and I still have some of those, I don't have a picture of them. 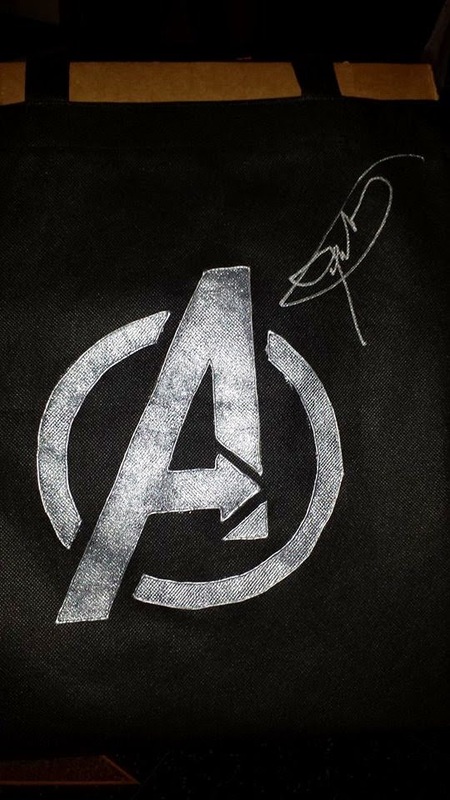 I saved a bag for myself and was able to get Jeremy Renner (Hawkeye) to sign it at the Thor: The Dark World Los Angeles Premiere! 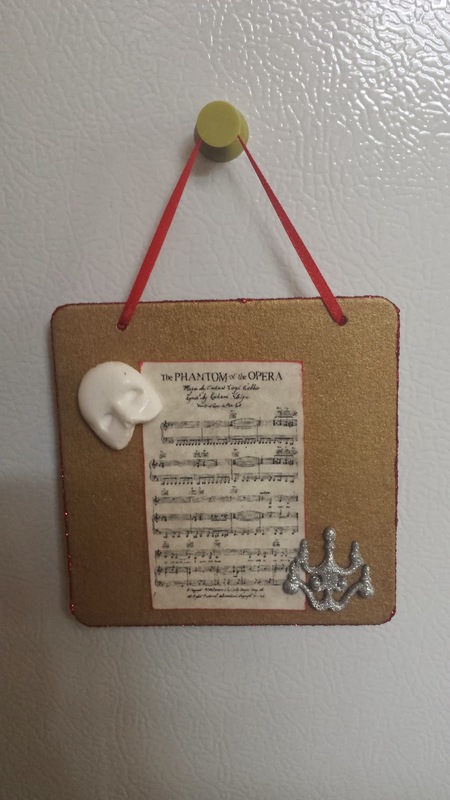 I made the silicone molds a couple of years ago with polymer clay, but this time I wanted something lighter for the mini plaques I made for this year's Phantom of the Opera themed dinner. The great thing about the air dry clay is that it blends together wonderfully in case you don't get enough to fill the mold on the first try. The bad thing is that although the molds are very flexible, the air dry clay is extremely soft which makes them challenging to remove from the molds without distorting the shape. 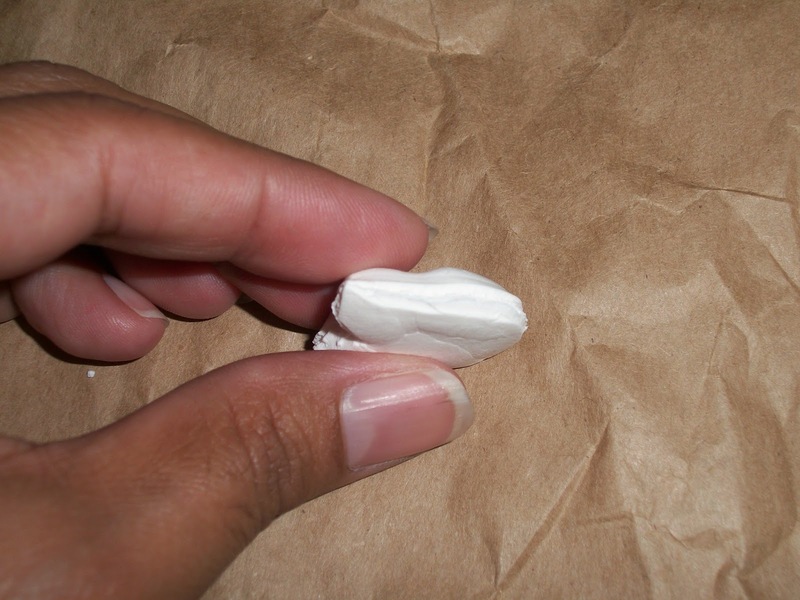 I pulled a small amount of clay from the package and rolled into a ball using the palms of my hands. I added or removed clay from the ball as I felt I needed. 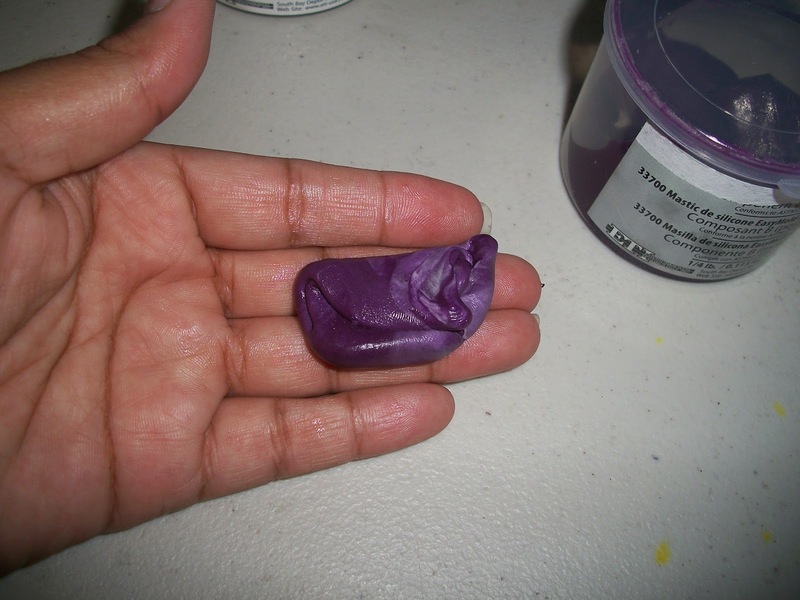 Once the ball of clay is the size you need, press it into the mold making sure to get the clay into any crevices. I let the clay set for about 5 - 10 minutes to make removal from the mold a bit easier. 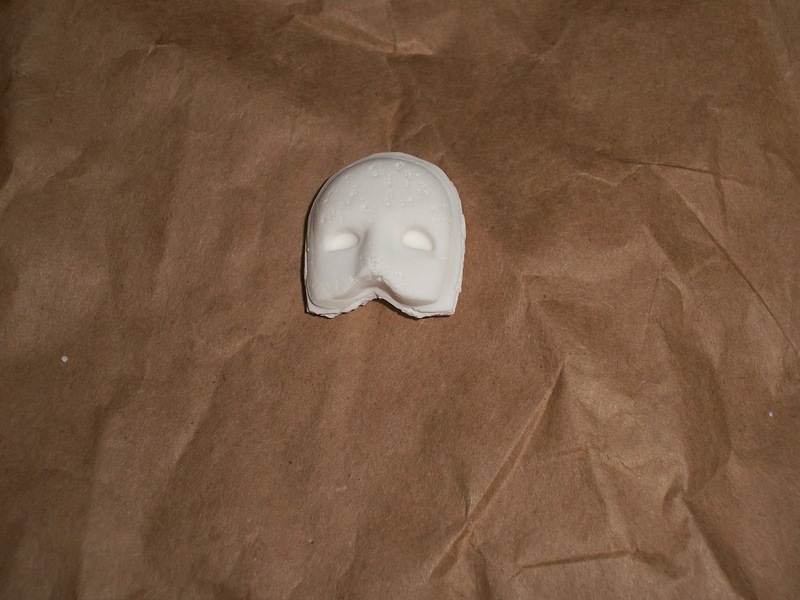 The mold created thick masks, just over 1/4" thick in spots, and took 3 full days to dry. After 1 day of drying - before trimming. I trimmed the excess clay around the mask after 1 day of drying. I wasn't sure how easy the clay would be to cut once it was completely dry, so I did it while it was still quite soft. I just trimmed around the mask with basic scissors. I gently sanded the masks with 400 grit sandpaper to remove the rest of the excess. Even fully cured, the clay is fairly soft, so sand with a very gentle hand. Apply sealant or Modge Podge. 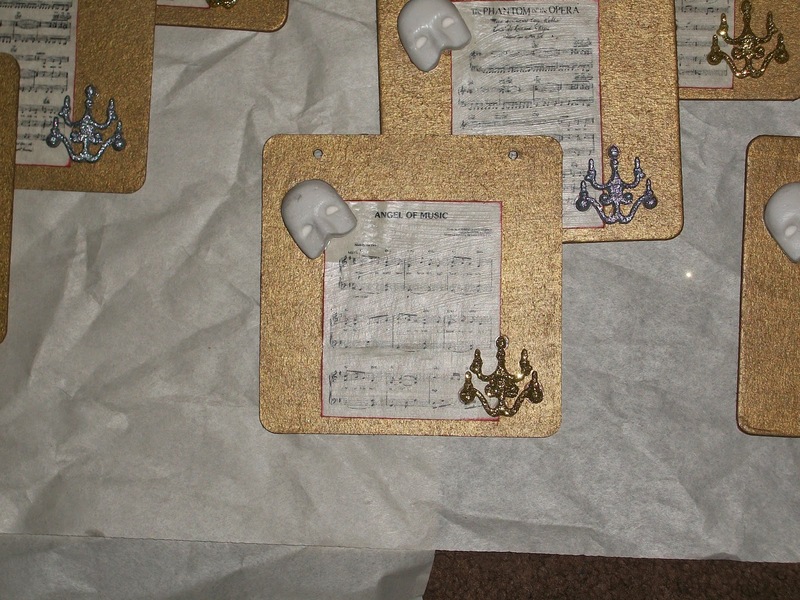 I only used 1 coat of matte Modge Podge since these were going onto a plaque where they will not be handled much. If you are going for a high polish shine, definitely use more than one coat and sand between coats. 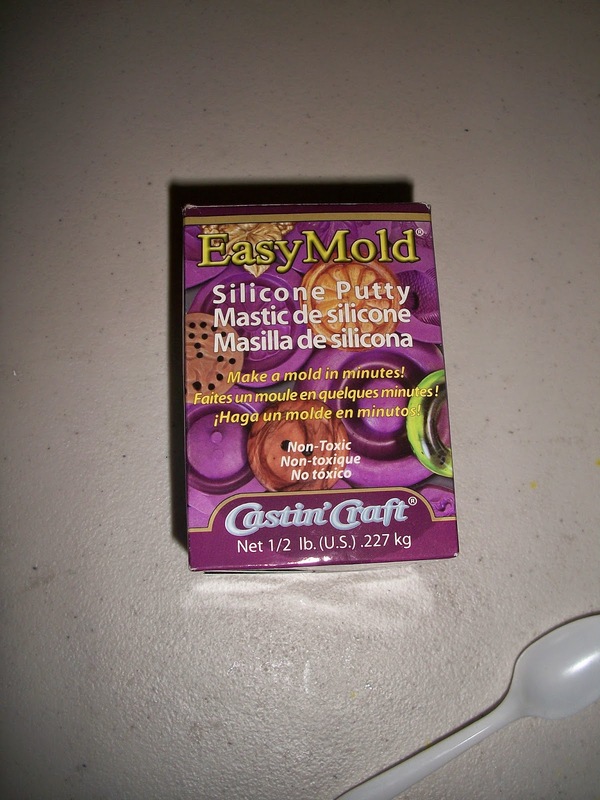 The brand silicone I used is Easy Mold Silicone Putty by Castin' Craft. This is a food safe silicone so you can use your molds for cookies or candy. 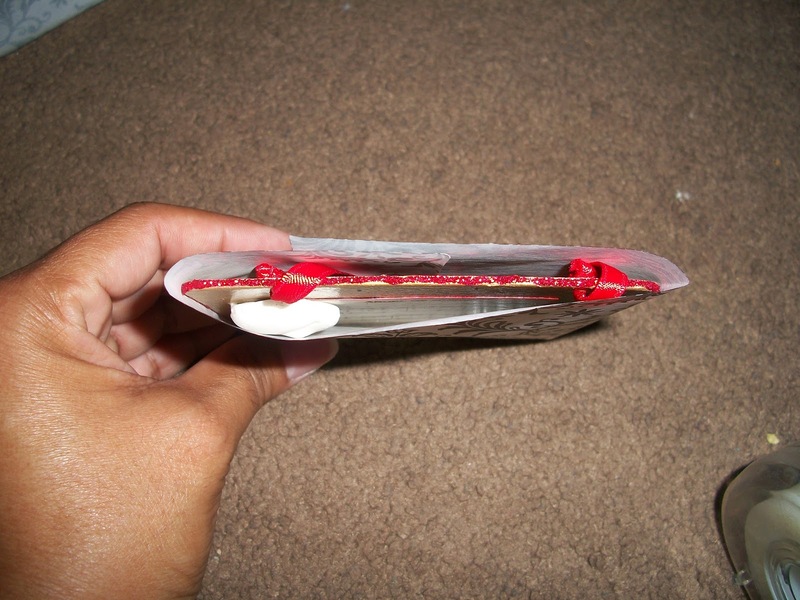 The package contains two components in which one is white and one is purple. 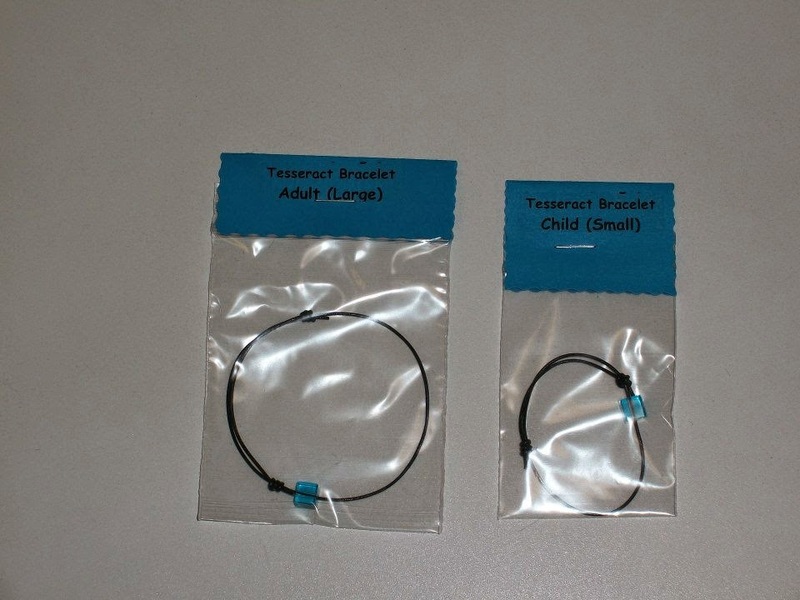 The instructions in the package are very simple, but I'll make it really easy. Take equal parts of each color and mix together until the color is uniform, without swirls. You have about 3 minutes to create the mold so have whatever you're going to use immediately available. 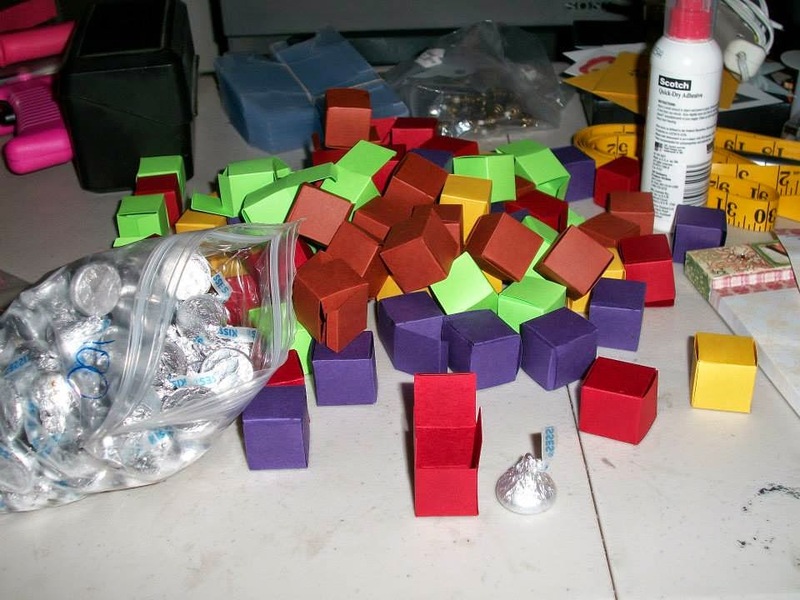 Middle of mixing components together. 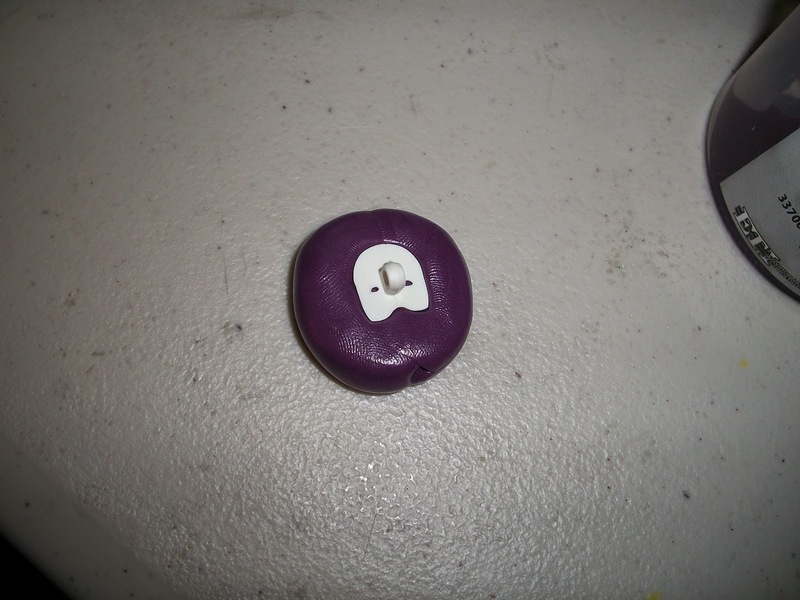 I was using these, very expensive, plastic Phantom mask buttons I had purchased (if the buttons were inexpensive, I would have just bought a bunch of them). The first project I was using the masks for I needed a quantity of 40. I formed the silicone into a ball shape, then pressed one of the buttons into the silicone and waited for it to set as per the manufacturer's instructions (about 25 minutes). The instructions recommend leaving whatever your using to create the shape of the mold in the mold during storage. I hadn't done that, and they worked just fine 2 years later. 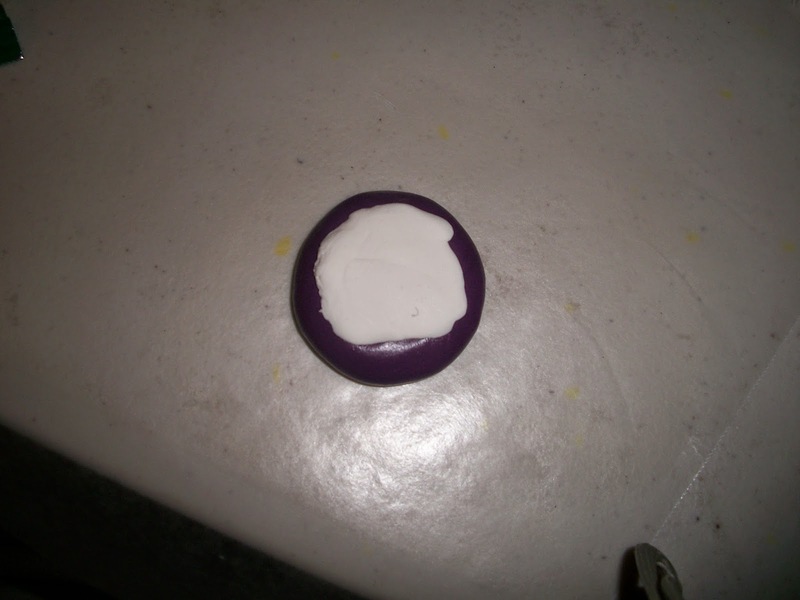 Button in the silicone during the curing process. 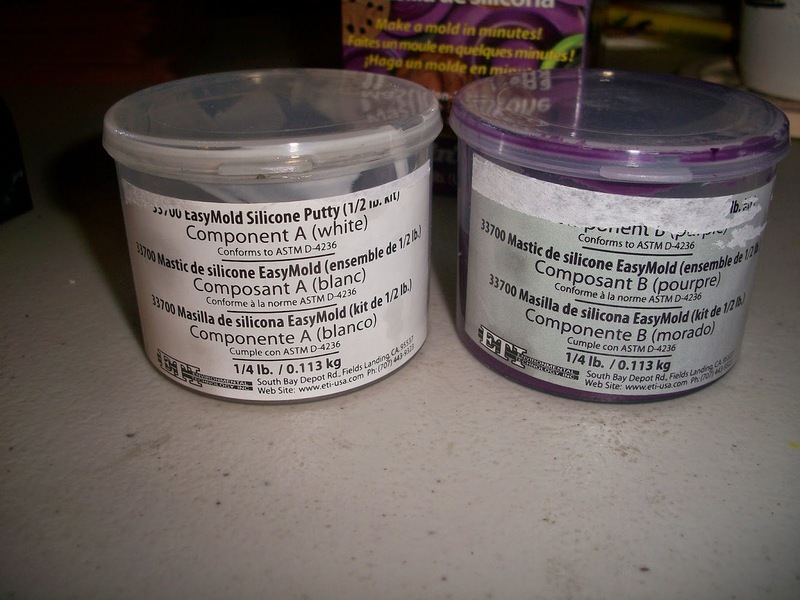 I haven't used the silicone putty to make molds for edible items, and the manufacturer advises against using the mold for food items after using other materials in it. 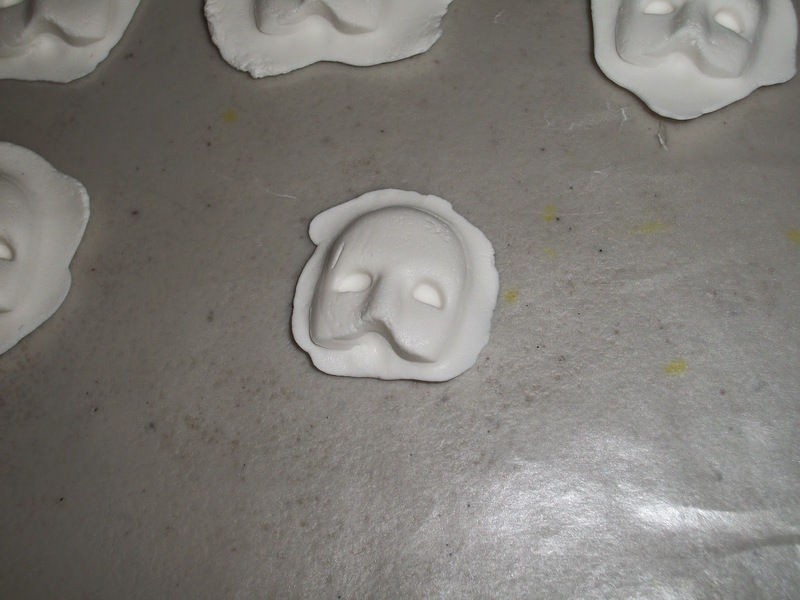 A few weeks ago, I made 30 masks for a Phantom of the Opera themed charity dinner a group of friends throw every November. 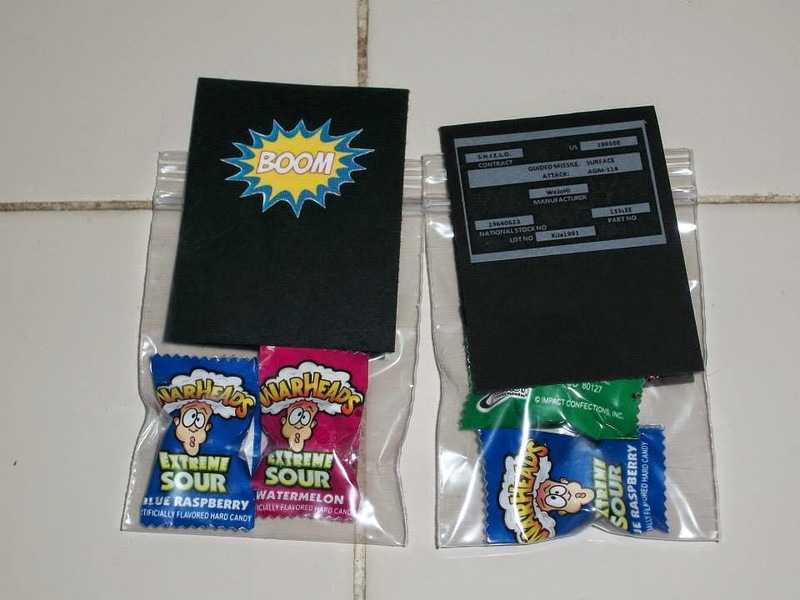 I was making the favors to go in the goody bags for each attendee. 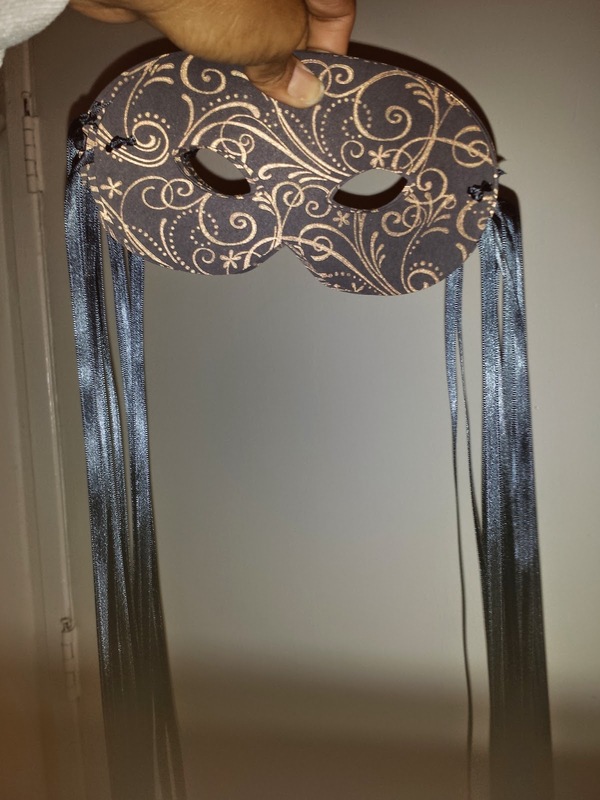 Each bag included a bracelet with a sparkly connector charm, this mask, a notebook like the one here, a bookmark, and a plaque which I will post later this week. 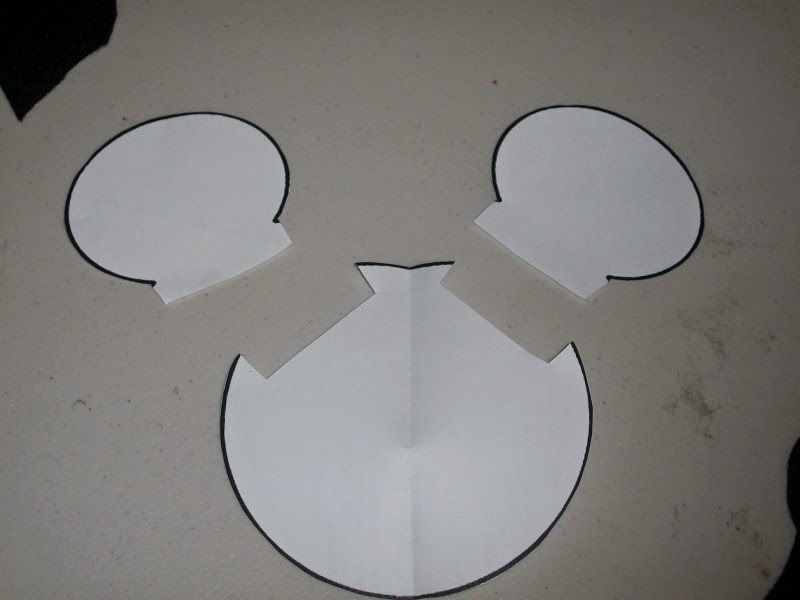 I used my Cricut to cut the masks, but you could easily find a template online and cut the mask by hand. Cricut Cartridge: "Chic & Scary"
Stampin Up - Stampin Around stamp in "So Swirly"
Cut mask on Cricut at 7" (Speed: Medium, Pressure: Medium, Needle: 5). 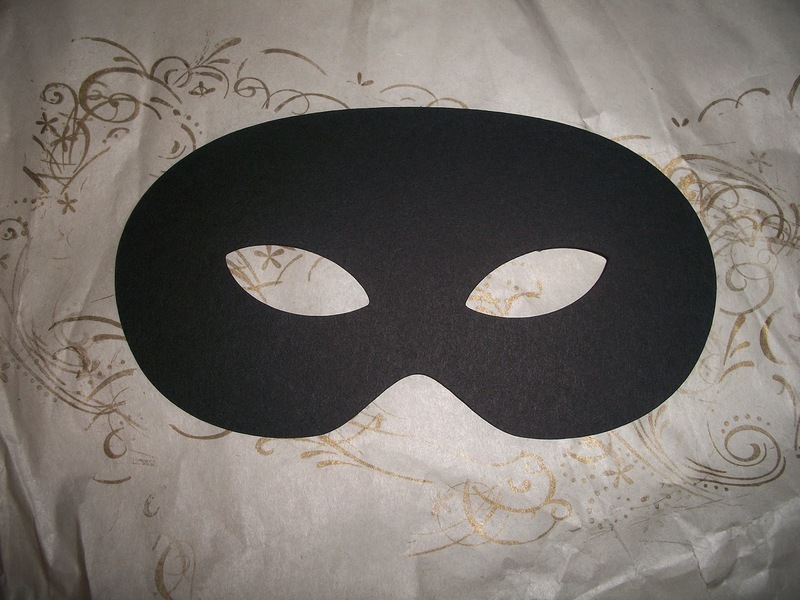 I could get two masks per 8 1/2" x 11" sheet of cardstock. 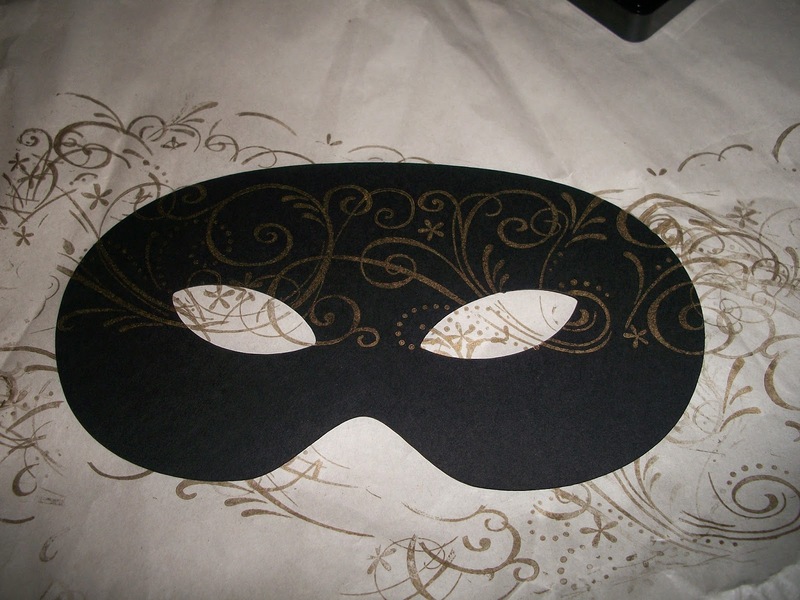 I went very basic for the decoration on these masks, but have been much more detailed in past years. 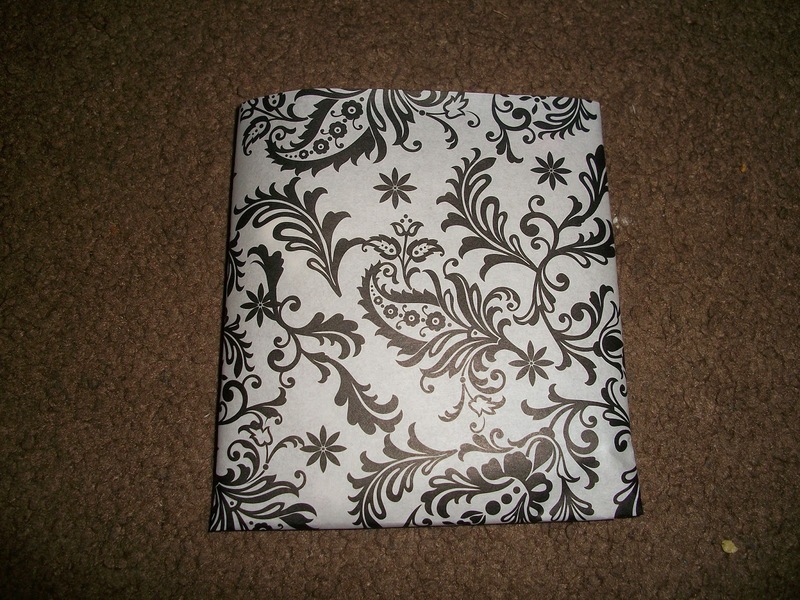 I used the Stampin Around stamp by Stampin Up in So Swirly and used a standard ink pad. Some masks I did in gold and others in copper. My gold pad was drying up so more masks ended up with copper ink which showed up better on the cardstock anyway. Due to the height of the mask being larger than the stamp, I rolled the stamp across the top of the mask then the bottom half. I wasn't being too precious about matching up the pattern and there was some overlap. The pattern of the stamp looked fantastic wherever it overlapped, so it was definitely not worth fussing with matching it up. First pass with the stamp on the top half of the mask. You can see where I missed a small section on the very top. Second pass with the stamp on the bottom half of the mask. 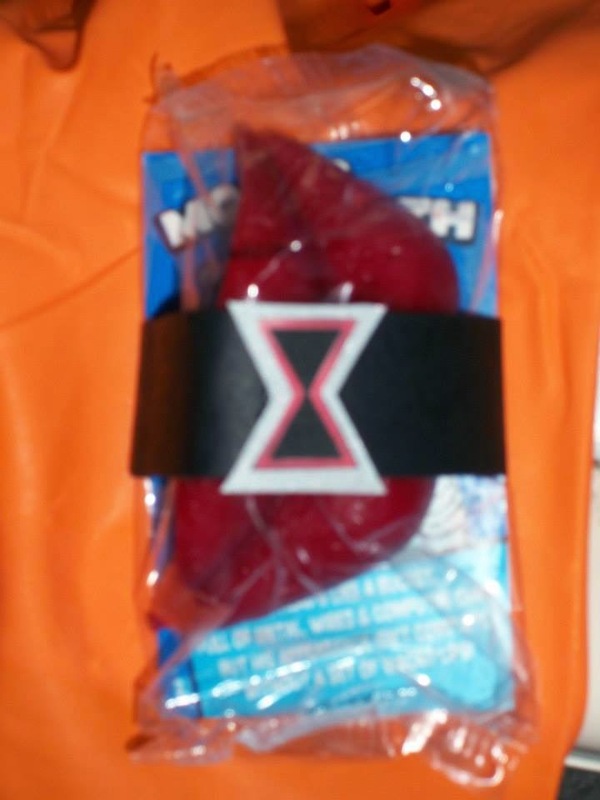 I put the knots on the front side of the mask, but it can knotted on the backside as well. Voila! 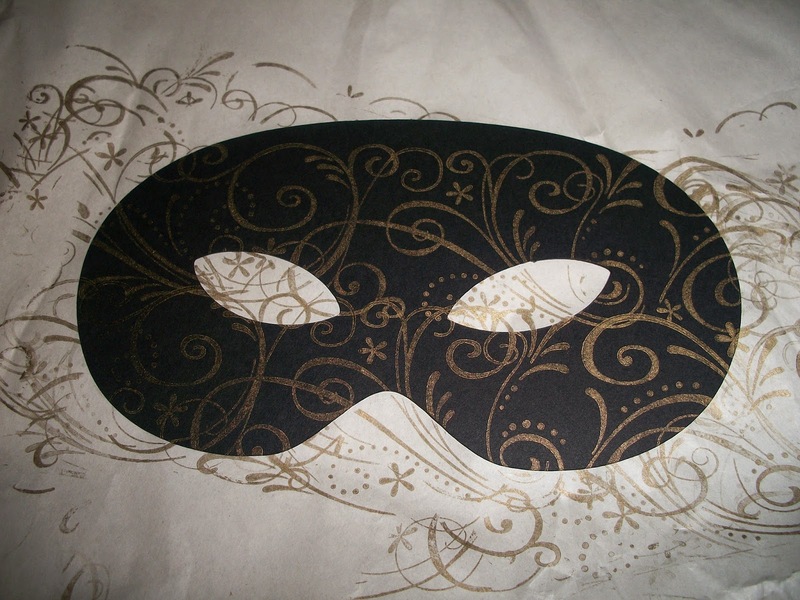 You have a great mask for your masquerade party! 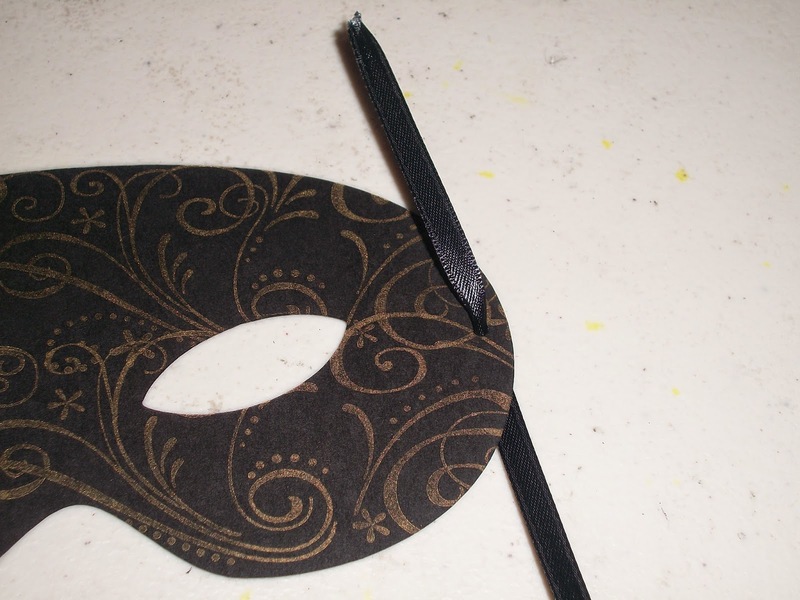 Remember you can add all the bling and gitter you want to your mask, and these would be a great craft to make with the kids!